Many are caught unawares by the Revolution. Others have been preparing for months. Some are vocal bystanders, others wield immense power. Which are you? RT’s #1917LIVE project puts the immersive character experience at our users’ fingertips. Covering the most defining event in Russian history is no easy feat. 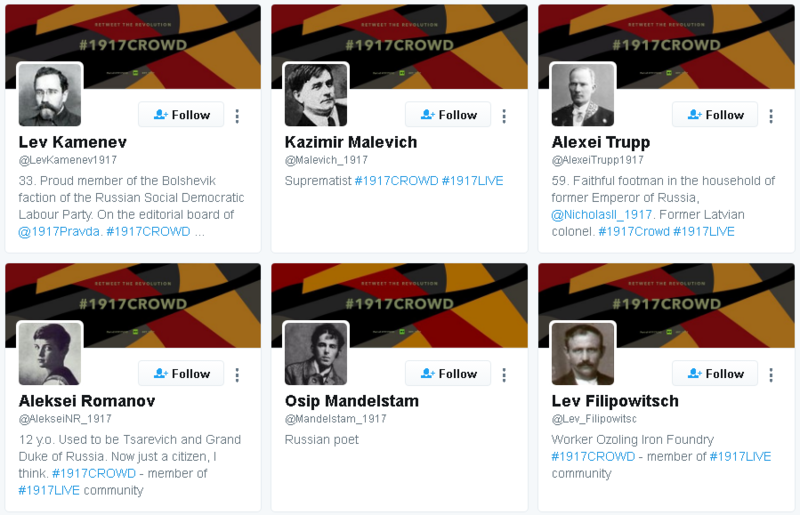 RT’s reconstruction of the Russian Revolution did not get to where it is without our users breathing life into its many witnesses and participants. So, join in, inhabit the player of your choice, and help us make this the most memorable online re-enactment ever. Below are just some of our most prominent figures, as controlled by project fans, each with his or her own stories to recount. Alexei is the youngest child and only son of Nicholas II and Empress Alexandra. The Tsarevich is being kept almost blissfully unaware of the political events going on around him. Good-night tweets, the joy of rural outings and photos of Faberge eggs bearing the Royal Family’s popularity slowly make space for sad musings on the future of Russia and the apparent savagery of the rebellion. A newcomer to the project whose pioneering photography left us a priceless heritage – colored images of pre-revolutionary Russia. Using the three-color principle, Sergey Prokudin-Gorsky perfected a technique that others before him could not quite master. His beautiful photography has made its way onto his Twitter account. He’s new around here, so more is sure to follow. Paley despises Lenin and has no love for anything of what the revolutionaries have to offer. She is the second wife of Grand Duke Paul Alexandrovich – the uncle of the Tsar. Despite their unequal marriage causing a huge scandal at the court, Nicholas II later grants her the title of Princess Paley. She engages in philanthropic work during the World War. Among the #1917CROWD there are also the major power brokers of the period. We have King George V of Britain – Nicholas II’s cousin (as well as that of Germany’s Keiser Wilhelm II) and close friend, who, despite the obvious opposition of many of his contemporaries, decides to cancel his offer of asylum to Russia’s Nicholas and his entire family. United States President Woodrow Wilson has also joined the party. The 28th President, Wilson is behind some monumental changes to the 20th century, such as the Fourteen Points speech and the introduction of the League of Nations – a prototype of the United Nations. In April of 1917, Wilson is forced by Germany to enter the US into the World War. We also have renowned authors and artists tweeting to their heart’s content – with notable mentions going to avant-garde pioneer Kazimir Malevich and poets Osip Mandelstam and Vladimir Mayakovsky. And don’t forget, you can also don the guise of a newspaper editor of yesteryear. We already have The New York Times and, of course, the iconic Pravda – which was instrumental in disseminating the early ideas and writings of Vladimir Lenin before finally becoming the official paper of the Bolshevik party.